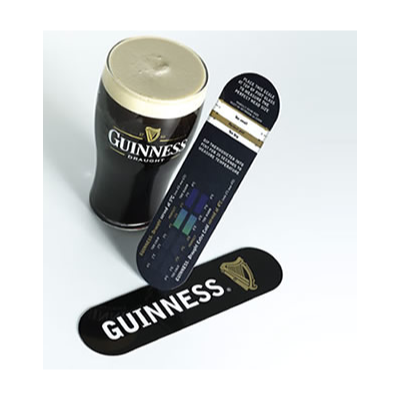 We are the leading UK manufacturer of liquid crystal colour change promotional thermometers combining technological innovation and accuracy with striking designs. Our superior knowledge of the production and printing of liquid crystal ensures that the client receives the highest quality and most reliable liquid crystal products on the market today. Colour change thermometers are informative! And provide plenty of space for branding and getting your personal message across to your target audience. Ensure a comfortable room temperature, neither dangerously hot or too cold, for children’s rooms/nurseries, homes (particularly for the elderly in the Winter months), the work place: offices, schools/colleges & factories and storage areas for perishable goods. Room themometers can help significantly with energy costs with a small adjustment to the thermomostat saving vast amounts on fuel bills every year. 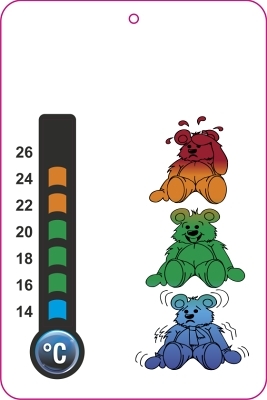 A safe, non-invasive and trouble free way to take a body temperature in only 20 seconds, particularly good for children. Special adhesive backed versions are used in operating theatres, schools and for mass screening. 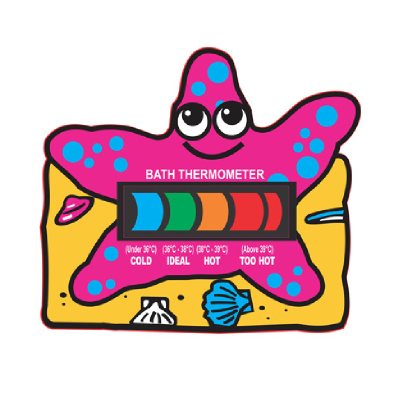 We were approached by Australian retailer, Wyfly Pty Ltd. to develop a thermometer which could be used to measure the temperature of frothed milk for Coffee. The client required a measuring device which could be easily read and used and would be hygienic. As a global leader in liquid crystal thermometry and a comprehensive knowledge and expertise in the research, development, production and marketing of it we were readily able to develop a product which could be applied to the outside of a stainless steel jug holding steamed frothed milk. Foaming, Steaming, Frothing… pushing some air into the milk for your coffee improves and sweetens the taste compared to flat milk. 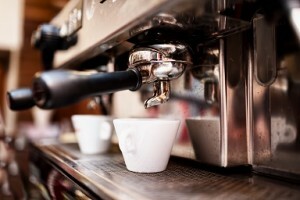 There’s a perfect temperature for perfect froth depending on the milk you use, and once you find it you can keep on making light smooth rich froth every time. CapperfectionTM Froth Meter shows you that perfect temperature, every time. Step 1: Put cold milk in the milk jug (the colder the better). Step 3: Different milks froth at slightly different temperatures. Experiment with slight variations either side of 65°C to learn what temperature suits your favourite milk. 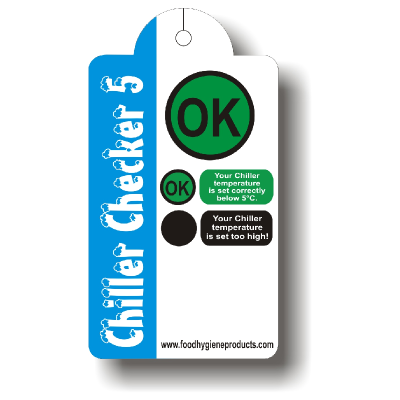 A thermometer is an essential item within a fridge. Plenty of space for branding and seen every time the fridge is opened! Liquid Crystal Fridge and Freezer thermometers give accurate temperature readings and ensure that food is stored at the correct temperature. B&H supply all the major European Fridge Manufacturers. 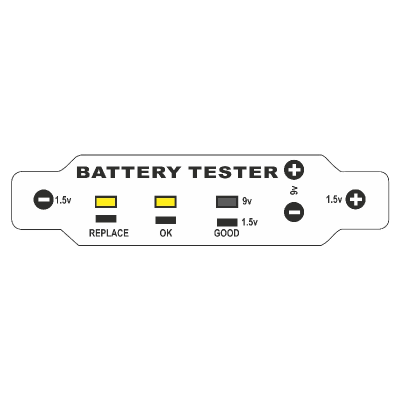 Liquid Crystal Temperature Indicators for cold drink chiller cabinets are popular for brands that need to be drunk at a colder temperature for maximum enjoyment. 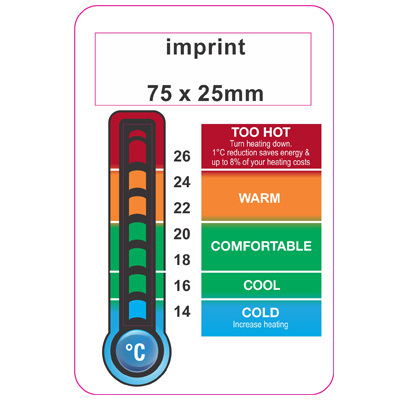 Laminated Dipper Thermometers are available for checking the actual temperature of dispensed drinks. To ensure that correct storage temperatures are maintained. 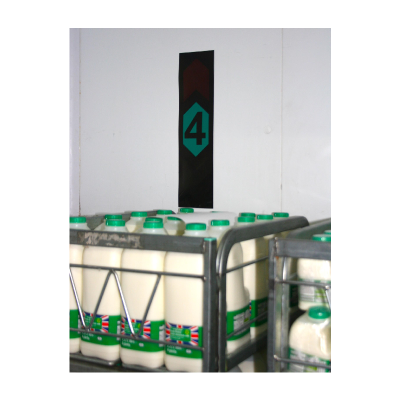 Supports due diligence and ensures that food reaches consumers in its best possible condition. Innovative products for use within the office and home environment. All available for branding with your own message, company details or logo.